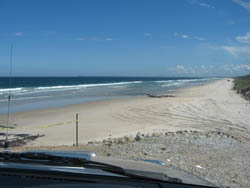 This Sand track leads all the way to the Black Rock camping area. Do not go too far north because it leads to the Evans Head Gunnery Range, which is an active RAAF bombing range used by F-111s! It is north of Jerusalem Creek. Check tide times.